There are nearly 75,000 refugees and asylum-seekers currently in various reception centres across Greece. The Greek government said it plans to transfer up to 6,000 people from the Greek islands to the mainland to improve their living conditions, but many observers are skeptical. The number of refugees and migrants seeking asylum in Greece is nearing 75,000, according to the latest figures from Greek authorities. As of November, approximately 74,000 migrants and refugees are being hosted across the country at various reception centers. Most of these centres are woefully overcrowded, and living conditions within them are grim. Since the beginning of the year, over 42,000 refugees and migrants have entered Greece illegally. Arrivals are not expected to increase in 2019, but the huge backlog of asylum applications and slow processing time - sometimes more than 90 days - leave the Greek government little room for manoeuvre. "The most challenging issue we have seen in 2018 is the large increase in arrivals at the Evros land border," said Greek Migration Minister Dimitris Vitsas at a press conference. As of November 12, 14,250 arrivals were recorded via Evros, although the actual total is estimated to be closer to 16,300. In 2017, the corresponding number was just 5,500. The Evros region in northeastern Greece is the only part of the country that shares a land border with Turkey, a transfer country for many migrants and refugees trying to get to Europe. 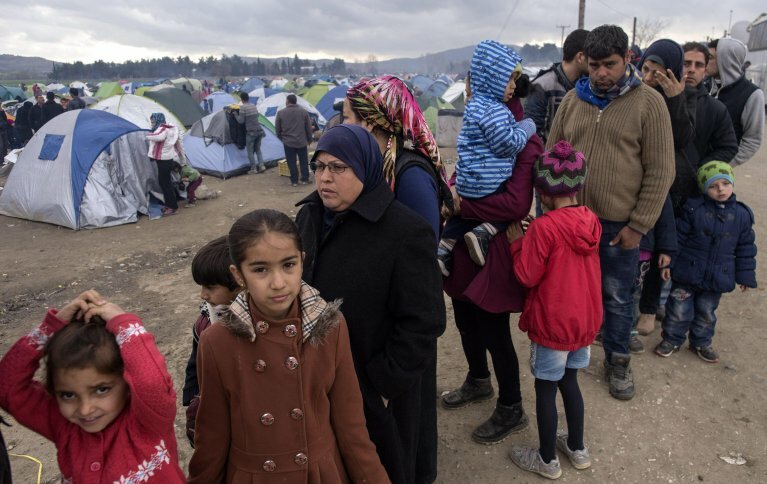 The government has come under constant criticism and pressure from human rights groups to speed up transfers of asylum-seekers from camps on the Aegean Islands, where conditions are worst, to the mainland. Dimitris Vitsas said the government will arrange for the transfer of up to 6,000 people to the mainland into more suitable accommodation by the end of the year. "The situation is incredibly difficult," said Vitsas. "Now, for example at Moria [on the island of Lesvos] we have around 20,000 asylum-seekers staying in structures designed for just 10,000. Our priority is to get as many as possible from there into apartments for six months and into an integration program." This is not the first time Vitsas has made public promises to lighten the burden on the islands by transferring people to the mainland. Earlier this summer, he said the government would speed up relocation efforts and ensure that the combined number of migrants at overcrowded camps on Lesbos, Chios and Samos would be cut to 10,000 by September. But the migration authorities did not fulfill that promise, which is why many in the local media, as well as human rights groups and NGOs, are skeptical of Vitsas' more recent promises. The migration minister has also pledged to set up small-scale health centers in each of the camps on the islands of Lesvos, Samos, Chios, Leros and Kos, to ease pressure on the local hospitals. Following a damning public health report on the Moria camp that came out in early October, Vitsas said a sewage treatment plant should be completed there by March 2019.